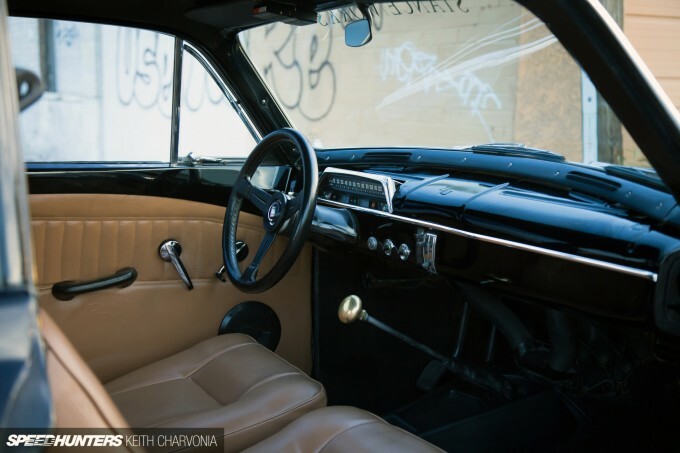 Full disclosure, this is an article about my friend’s car. Keith Ross and I are friends for a few reasons. We share the same hobbies, building cars and taking pictures of them, and we grew up in the same place and time too. We share the same name, which makes it particularly awkward when yelling across the garage for a tool. What I admire most about Keith though, is his ability to stay in tune with automotive trends. He wants to know what the next big thing will be, so he keeps a watchful eye on social media to see what the kids are up to these days. You see, we both grew up in the Arizona minitruck scene before turning to other genres. 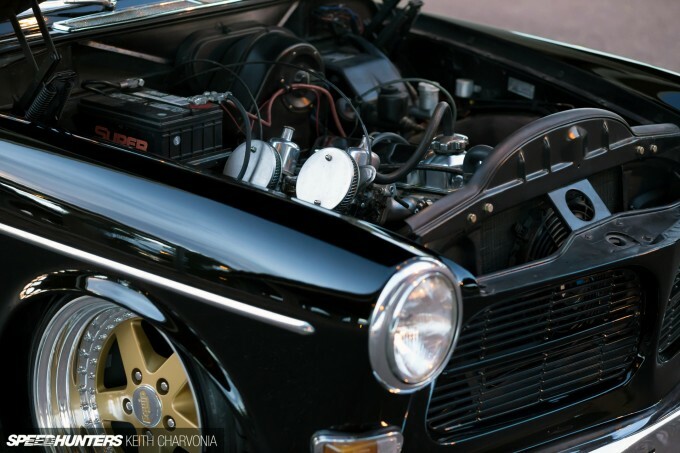 After going through some minis and imports, he took a break from the scene before deciding to jump back in with something completely different. 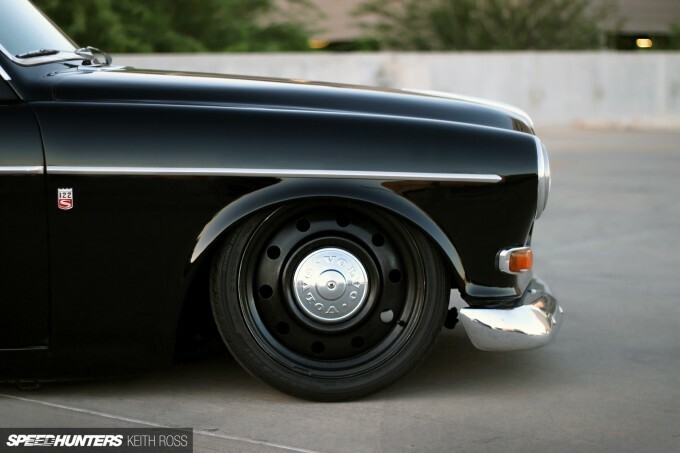 When he built his bagged 122 it was pretty ground breaking, and it’s safe to say that Keith Ross’ Volvo has inspired many more after it. 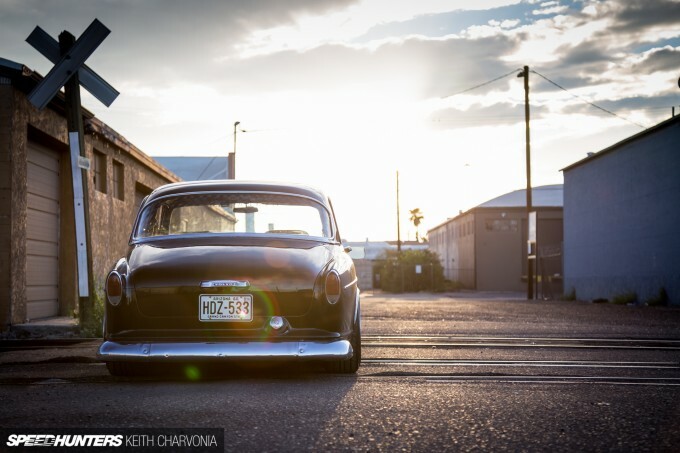 The first time out, Keith went with a steel wheel setup using 17-inch Dodge Charger spares. He has since lost count of how many private messages he’s received inquiring about the setup. Wanting to break out of the mold he had created, Keith started thinking about how to change up the style of his build. Browsing the American Racing catalog one day, he came up with the idea to order some Salt Flats built to his own specs. 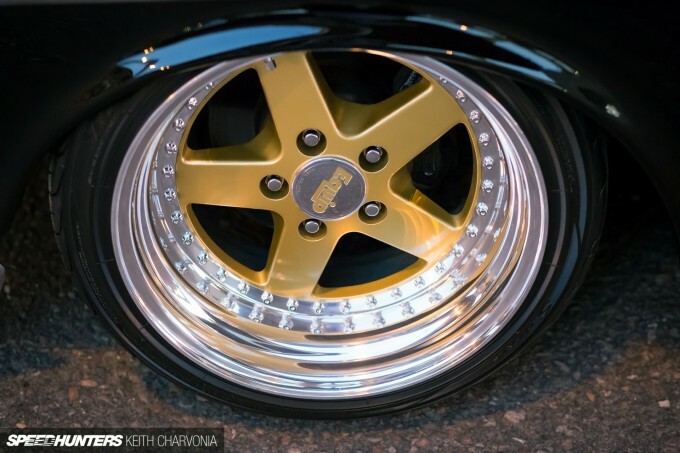 It doesn’t hurt that Keith Ross can make beautiful images of his own car – a definite edge when it comes to getting attention from sites like Stanceworks and becoming Insta-famous. I’m sure you’ve noticed by now that both of these early wheel setups were tucked, something that must have come second nature to a former minitrucker. Then a few months ago I got a text from Keith saying something along the lines of, ‘Dude, I’m so bored with my car. 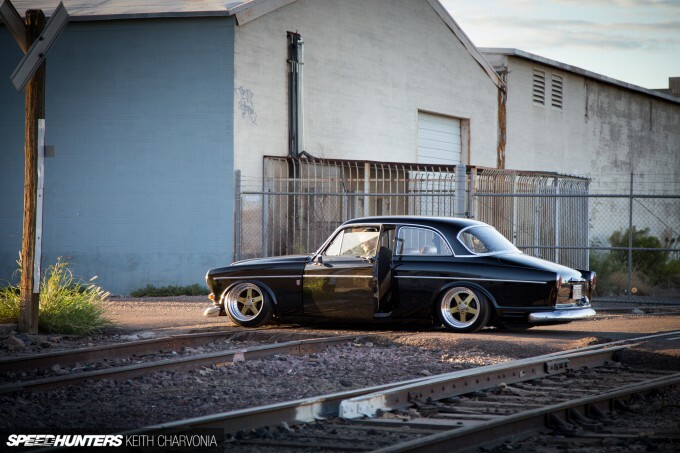 I’m thinking about doing something off the wall.’ He wanted to reinvent his Swedish car with a JDM twist. After some conceptual work in Photoshop, it was determined that it wouldn’t take more than a wheel change to completely turn the build theme on end. 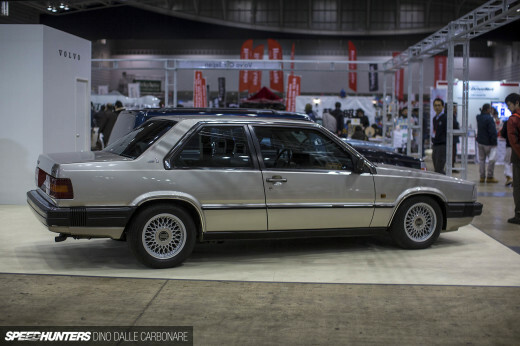 Next came the daunting search for the perfect classic Japanese wheel. How new could he go? A mesh wheel or spoked? Should he stretch the tires and go for a hellaflush look or let them tuck like before? And how would this all flow with the classic lines of the 122? At one point we were even discussing Datsun fender mirrors and a duckbill front lip, but in the end Keith decided to go with a more restrained version, which I absolutely agree was the correct route. 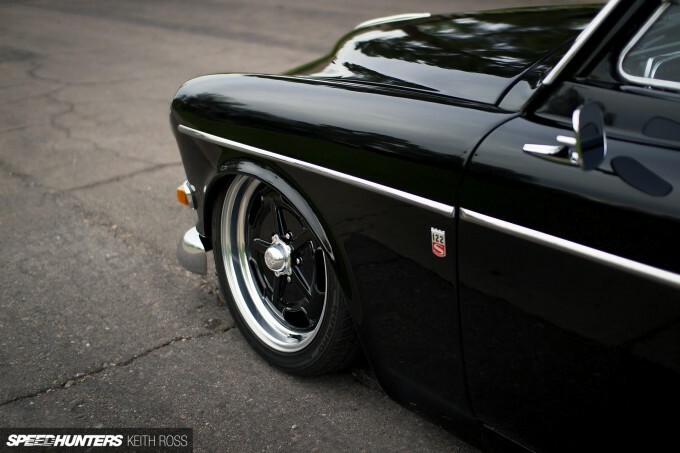 I’m sure you’ll agree, the wheels completely transform the car from a classic cruiser to something more edgy and current. Once he had the Work Equip 05s sourced from Japan they were torn down, the centers repainted (in my garage), and then rebarreled to get the exact offset and width for the car. I think Keith’s foray into wheel building was equal parts fun and frustration, but he can say he built them himself, which is pretty cool in its own right. 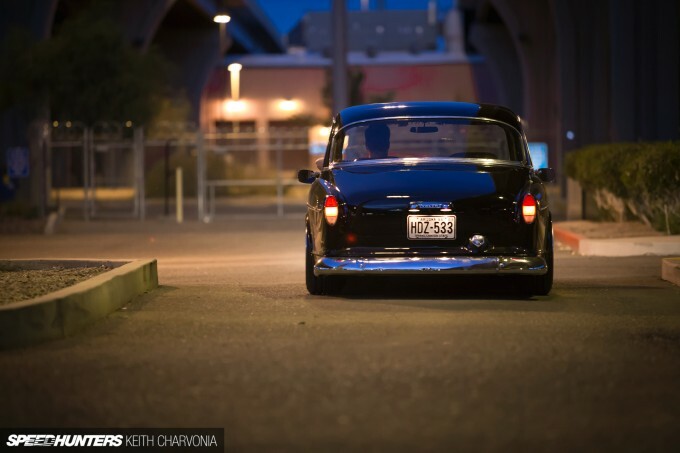 After tons of measuring, double checking, head scratching, camber adjusting and measuring again, Keith finally arrived at the exact size and offset for his Volvo. 16-inch barrels were ordered to form an 8-inch wide wheel with a -5mm offset, then a set of Yokohamas measuring 195/45 were stretched into place. The real trick here was making the wheels fit both the front, which would camber in, and also the solid rear axle with no camber gain. While the overall vision of Keith’s 122 is well thought out and executed, it’s the details that really makes it interesting. Weather-beaten badges were lovingly restored by hand to make for interesting eye candy wherever you look. 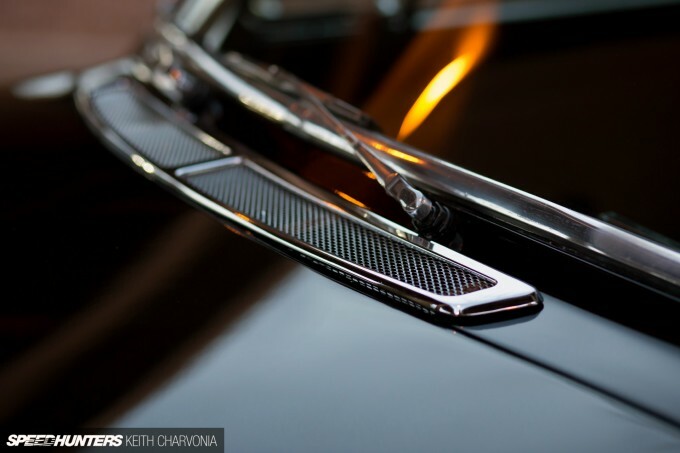 One of the first things he did when building the car was to have a coat of slick black paint sprayed over the aging, dull sheetmetal. The checked rubber seal around the original gas cap offers the perfect juxtaposition to remind you that this is still a classic. Chrome trim visually pops against the gloss black, but when you get to looking you’ll see bits of brass mixed in as well. 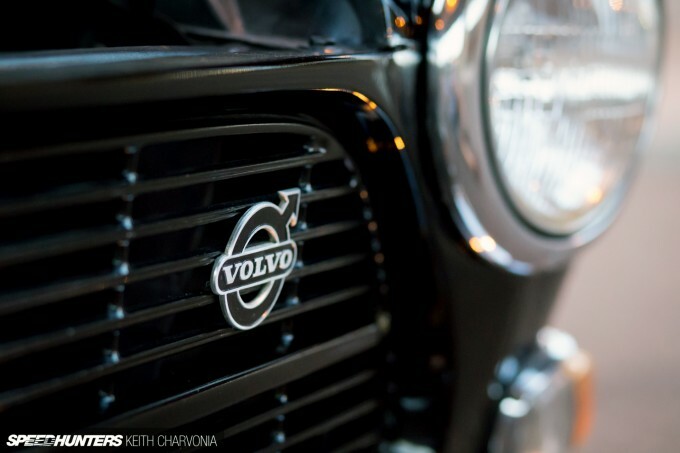 From the brass Volvo lettering on the hood to a hefty shift knob, it all blends so well. It definitely makes those gold Equips feel at home too. Inside, Keith had the upholstery redone as part of the initial build. 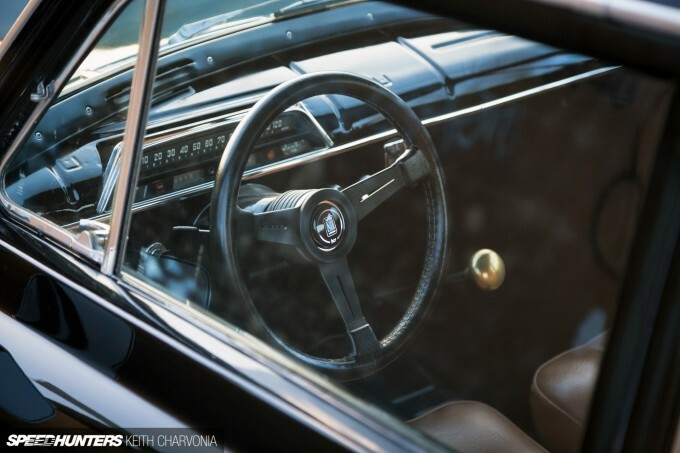 Again, ideas of new seats and gauges to fit the JDM theme were thrown around, but in the end the existing interior was deemed good enough, almost. 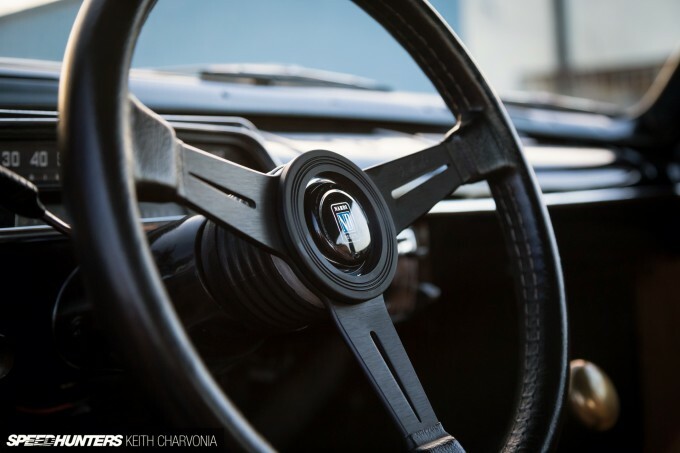 The one item that Keith knew he had to have was a Nardi Classic 360mm steering wheel. 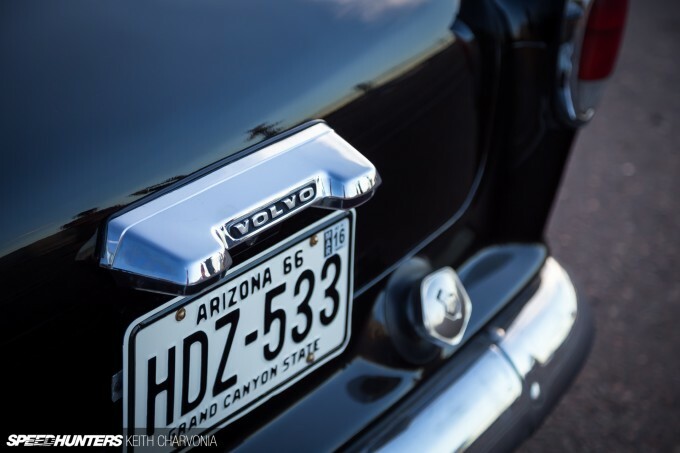 The stock Volvo wheel was just too ’50s looking to fit the new theme, and this one simple change made it all work. 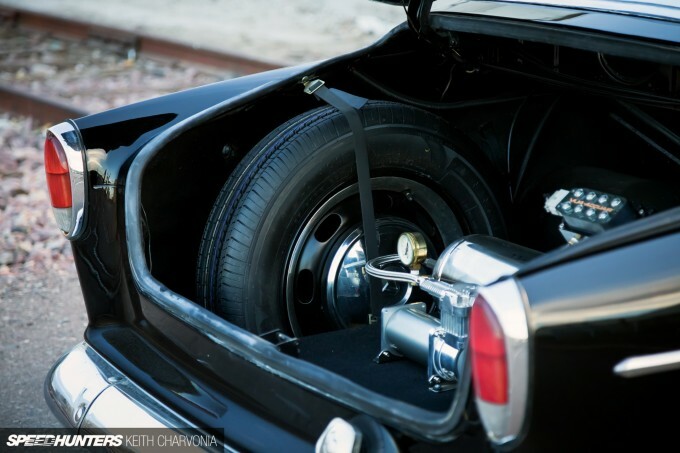 The trunk is just as detailed as the rest of the car. A spare tire is lashed down with a leather strap and the sanitary air management install features a carefully sourced brass air gauge. 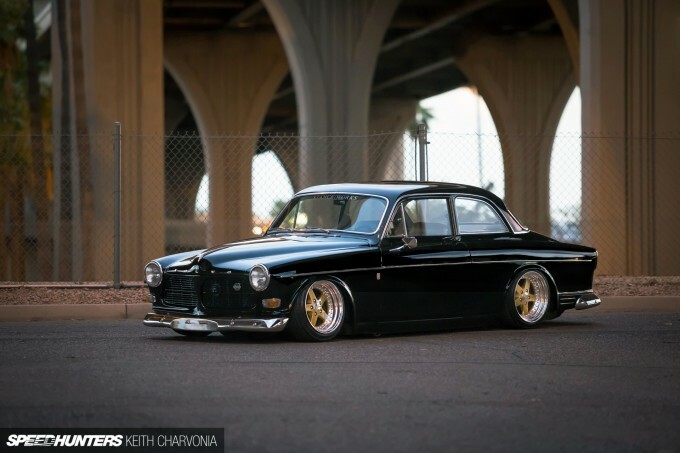 There was a time when Keith’s Volvo was just dropped an inch, but soon it became two and then three, and before long he started dreaming of a ground-scraping bagged suspension using modern, reliable components. The bags took some work since everything had to be custom fabbed, but there aren’t too many Volvo 122s that drag frame either. 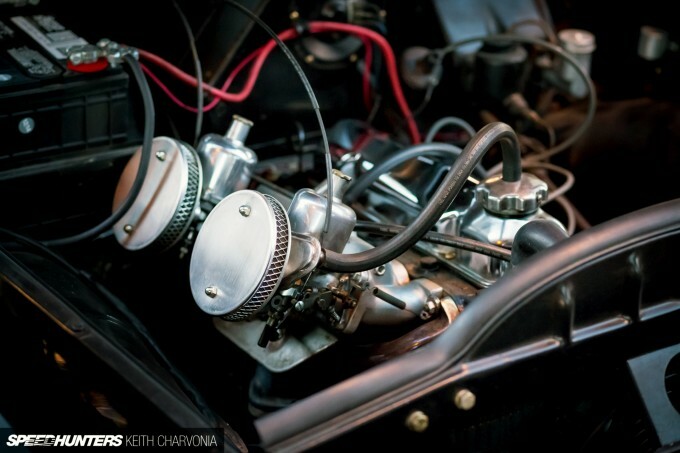 The car had sat for a decade when Keith got his hands on it, so a general restoration of the engine was in order. 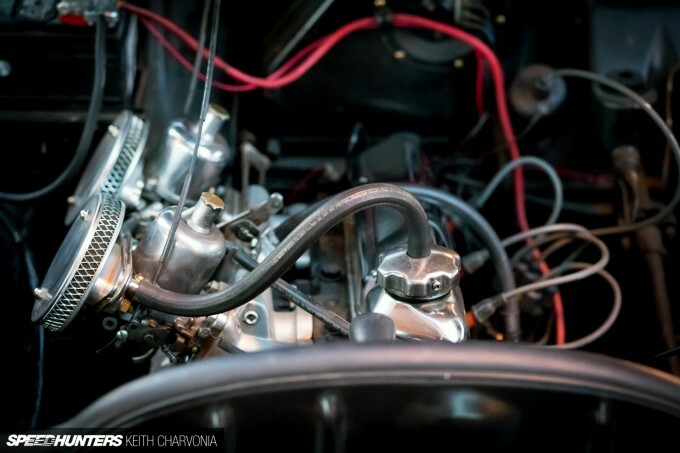 After cleaning things up and polishing anything he could, the little four-banger buzzed to life. 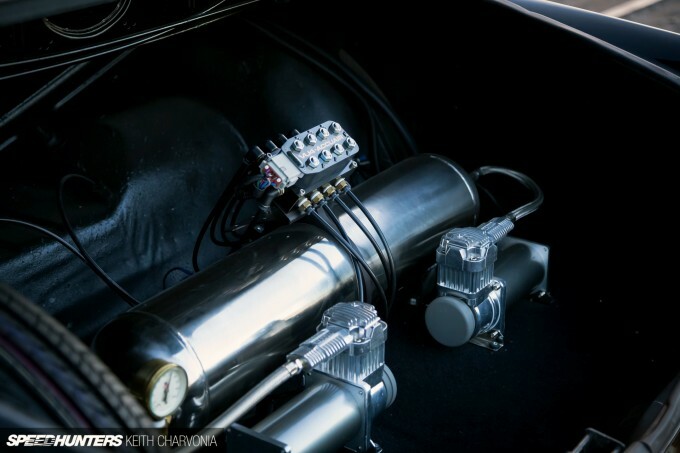 Dual SU carbs were fitted with aftermarket pancake air filters and the little B18 was put into service to haul the 122 around town for shows and cruises. 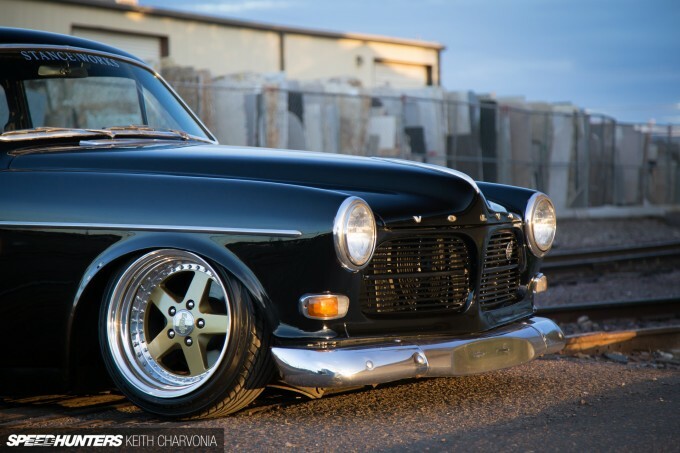 With the third iteration of this Volvo 122 complete, Keith feels he’s finally done with the car. In fact, he’s already been kicking around ideas for his next build. I can’t say too much, but you know with this guy it will be something unique and vintage, yet relevant to the current scene at the same time. We’ll just have to wait and see what he comes up with next. 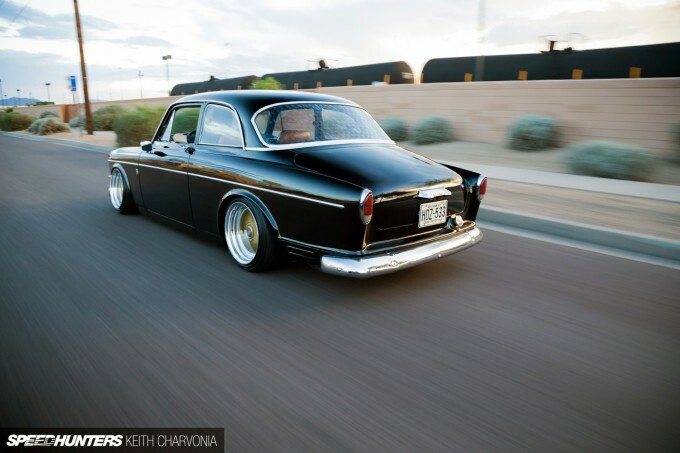 This .....is a volvo??? Its.....gorgeous! Volvo, eh...? Very nice. Thanks Keith! I forgot this was coming, great lunch time surprise. I love this car, though I do have a soft spot for equips, step lips, and air. I imagine there are at times Keith squared jokes? Ice Age I want a Ford Crown Victoria like the one in the movie with a nascar engine now..
That's a lovely looking 122. Those equips look good on anything really. 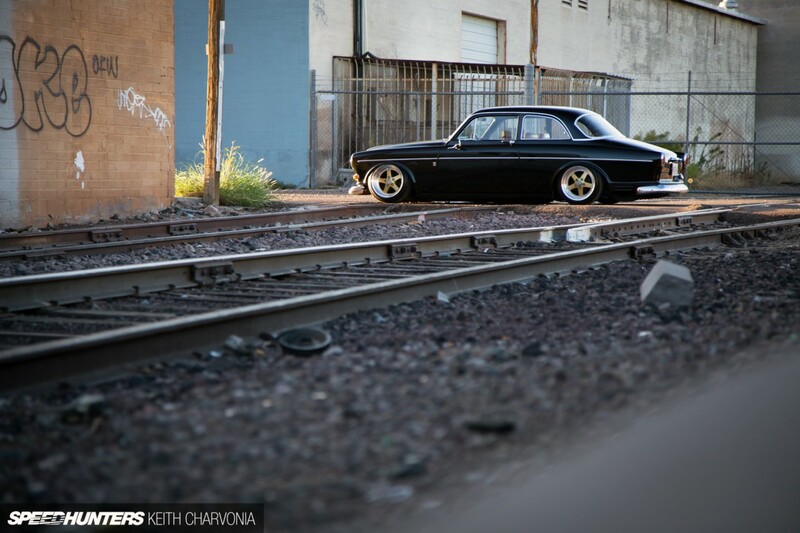 Stance or no, it's just a really clean old Volvo and I can dig that a lot. 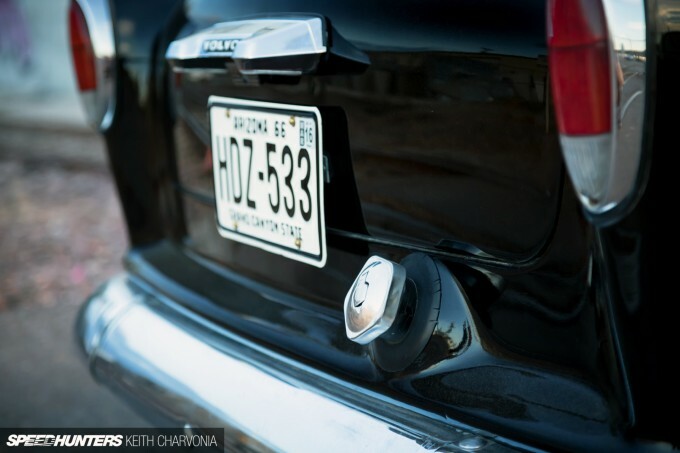 Speedhunters, you're done. No car you post from now on will top this. Really like the creative use of the steelies. RBJKT Thanks! It was a fun one and the light was oh so nice coming down the street by the train tracks. Looks amazing! Absolutely love the look! Ice Age I was expecting a Transformer. Meehh. Just a touch too far. The black tires blend in with the black paint. From certain angles it looks like it's just sitting on the rims. Needs a bigger motor too. But hey it's still a nice car. 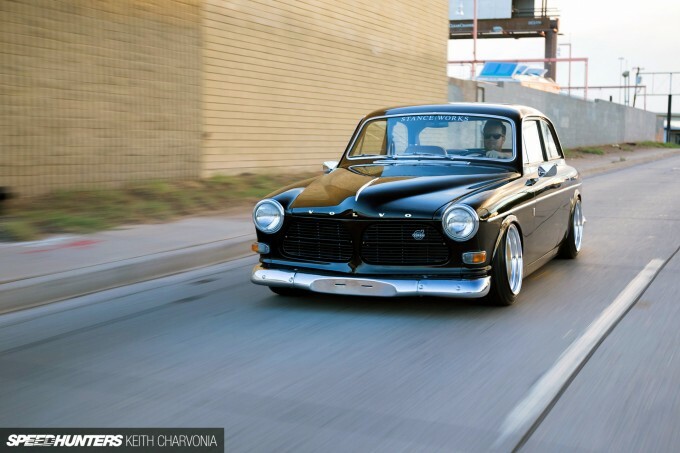 Another name is Volvo Amazon. The Equips are nice, different look for sure. But IMO those Charger rims suit it perfectly, yes it's whatever the owner wants but to be you just can't beat the black on black. Yeoch!!!! that's Sick!!!! such a nice build, little nuggets everywhere! 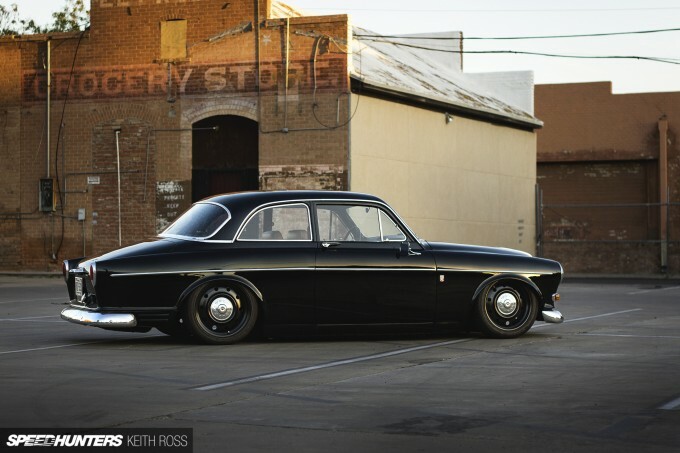 Very sweet car, 122s always look to me like a Rover P5 that's been "done right". Considering my interest in cars solidified during the brick-shaped '80s and early '90s, admitting a Volvo is a sexier option than anything else hurts my brain. But I would go there, oh yes, I would go there. Love it. Love the car of choice. 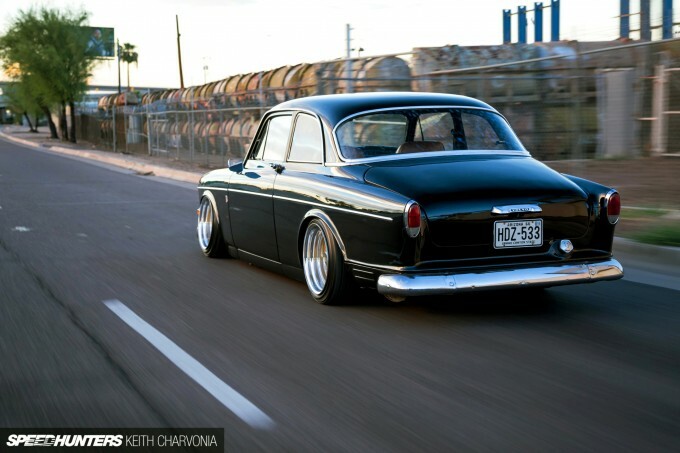 Love the stance. Love the wheels(all of them), and I'm surprised those Equips are 16's, I've always assumed they'd be 17's as they fit so well on the big body. Why try and keep up with or follow trends, do as you please, it's your car, why try to please the "kids"? Keith602 Spaghetti Make you hungry? LOL! I get what you mean, and I didn't particularly mean "kids" as in 16/17/18 year olds, but more so just how scene people are referred to as scene "kids" and wondering why anyone would feel the need to copy what they're up to, but you explained yourself, and that's cool. I too am by no means a kid anymore and still like to keep somewhat on trend, but it doesn't dictate what I do to my cars at all. I, like you, enjoy trying different wheels on cars from time to time that you wouldn't ordinarily think would work....and I think you've done well with all your choices! Great car BTW, look forward to seeing what you do next. Beautiful build. I love all the wheel variations as well. Well done! Nearly perfect for me. Just turn the rear bumper upside down to give it a rear diffuser style look. 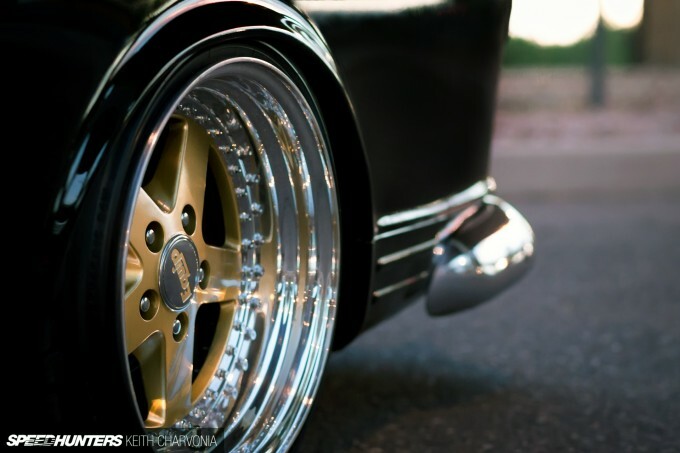 Love the steelies! Are those centre hub cabs original or custom made? Have been following this car for a few ear maybe longer now , some top class work and it actually made up my mind about getting one of these but thats easier said than done . but just a great build keith and great coverage keith . cant wait for the next build ! 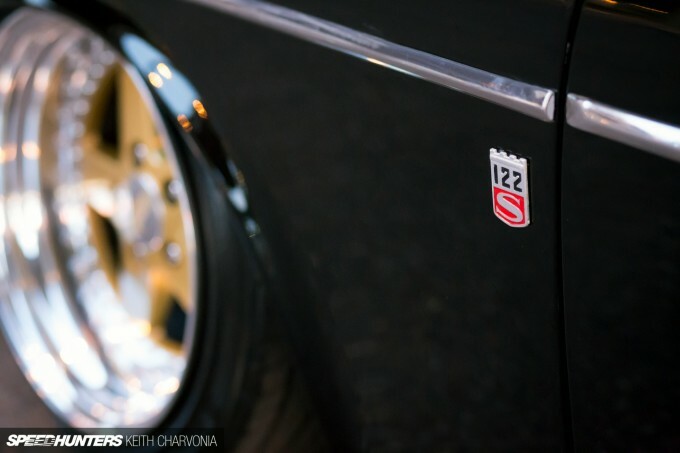 The 122 is in my opinion one of the best looking cars ever build and Keith did an amazing job. much better on those steelies without the camber on the front. black and chrome never looked so good! shiny is alive and well. takahashitothetop It's there sometimes. We will probably be taking the cars out more this Fall once it cools off. What do you drive? MC70 The beauty of this project is that it's been immortalized through photos several times with the different setups. Everyone has their favorite version, which is a pretty cool thing! JustinOdijk Just do it! Thanks for your comments. @MyLifeAsLouis They are original caps, but modified to bolt to the steel wheel. RacingPast That's a cool idea! I flipped the bumpers on my Kaiser too, a common '50s kustom trick. mrmjwilliamsx I think they would look weird with the lower profile tire he has to run. If he could fit big 70 series tires then it would be worth a look. Ildar Sadykov Not in America though. 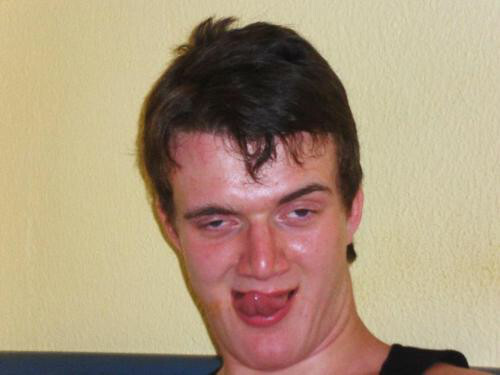 Putslicksonit Comment 2.0 pees all over comment 1.0. Taryn Croucher I knew you would! LouisYio Ice Age Sorry for the disappointment guys. DaveT Glad you liked it Dave. Nothing like a good Speedhunters lunch surprise car feature. KeithCharvonia MC70 You're absoluteIy right. Every setup has it's own thing going for it. Great project and by "hate" I meant dislike. MC70 KeithCharvonia Of course haha! is spot on. I must admit I really liked the salt flats too!Great story Keith keep them coming. This is a super nicely done car!